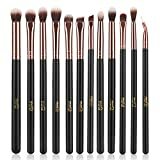 Having the right makeup brushes in your makeup bag makes a lot of difference if your aim is to get the perfect and flawless look without spending too much time. The right tools will enhance your facial features and provide a more polished look. Here is a list of 8 must-have makeup brushes for you. This brush is essential to achieve the flawless and perfect finish look. This brush helps you to put on light and streak a free coat which into the skin to give a natural look. It is not enough to completely rely on the self-applying stick and pen that comes in concealers. Use a concealer brush to bring out the best results of the concealer, as it will help you to reach those areas in your skin that can’t be reached by your fingers. This brush evens out the product when used around the eye area and nose. You could even smooth the brush with a small amount of product on it, above and below eyebrows. It will help to create the perfect edge to your eyebrows if you can trace this brush along the edge of the brow bone part. 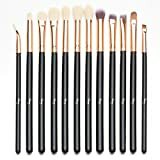 An ideal choice for the purpose of covering up blemishes and under eye circles would be a synthetic brush with a tapered end and slightly stiff bristles. This kind of brush is ideal to apply powder foundations like mineral makeup and to apply the last touch of translucent makeup to finish the look. It should be very soft, long and dome-shaped since you have to use it to apply powder to your entire face. Go for circular motions of buffing, in order to prevent the streaky finish. Powder brushes help you to apply loose setting powder and mineral foundations, with great precision. Apply eyes shadow evenly and smoothly with this brush over your eyelid. It should be a flat brush with rounded bristles and natural fibers. 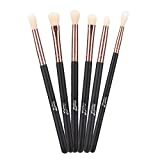 Ideal for blending shades, this tapered and fluffy brush can be efficiently used the eyelid crease, to get the soft smoky eyed look. This brush should be very soft if your intention is device application. A denser brush will give more color. Build the color as you go, by following the cheekbone contours. Swirl it around your cheek to get a good pop of color and flip it to get a harder angle as you go up to the temple, to create the perfectly contoured cheek. It provides precise and even application of color. Nowadays, retractable brushes are available that allow on the fly touch-ups. Touch up bright lip colors with this brush, to truly bring out the gorgeousness of bright and vivid shades. For regular days, blend a softer shade with the brush. This has many uses like brushes for your brows, to apply cream or gel eyeliner as well as to apply powder eyeshadow as a liner. Use an angled and synthetic brush for best results.